On March 23, the company held its business operating will of 2012, where Chairman of the board, members of the Party and government leading bodies of company, all staff of company headquarter and its subsidiaries in Beijing attended the meeting presided over by vice president Qiao Gong. The meeting analyzed the operating environment and the situation facing currently, and made arrangements for the 2012 business work and Party building. At the meeting, president Ji Xuecheng signed 2012 responsibility letters of business objectives with heads of business units and subsidiaries respectively. President Ji Xuecheng delivered a work report entitled “restore confidence , boost morale , unite and look forward to fight for the full completion of the annual operating objectives”, analyzing carefully the situation and tasks faced by the company, proposing general idea of operating work and business objectives in 2012, explaining the operating and management of the focus for the year, as well as hopes and requirements. He demanded that all cadres and employees conscientiously and fully implement the spirit of SINOMACH work will of 2012 and the spirit of the speech of Ren Hongbin, the chairman of SINOMACH, that based on work standards of “Uniting , hard working , truth-seeking, innovation, quality and efficiency”, that our company strive to achieve “quality growth”, “sustainable development” for the successful completion of the annual operating objectives and tasks assigned by the Group with dedication, pioneering spirit and diligence. Peng Mingjing, deputy Party secretary of discipline committee, delivered a work report entitled “Greet the Party's 18 victory holding with new achievement by Uniting & hard working, innovating , quality and efficiency”, combined with the relevant requirements of SASAC and SINOMACH for Party building on construction of anti-corruption, making specific arrangements for the company 's party-building work in 2012. Chief Financial Officer Zhao Shuangjun delivered a work report entitled “a clear understanding of the current financial environment, sparing no efforts to complete the 2012 business task” on financial environment faced by the company in 2012. He reminded business sectors of having a global concept and timely communicating with financial sectors when conducting business, hoping that all staff pay attention to and support the plan of business capital rolling, which would be established this year. Chairman Zhang Fusheng delivered an important speech after listening to the work reports above. He affirmed the achievements made over the years by CNAICO firstly. He said he was confident with CNAICO’s development for that CNAICO was a cost-effective company, which had complete segment, good basis, and large scale with a good team especially. As to the operating work in 2012, Chairman Zhang Fusheng pointed out that the cadres and workers should forge ahead in unity, strive to open up new markets, strictly control the risk, try task decomposition and responsibility implementing, and actively offer advice and suggestions for the development of the company. 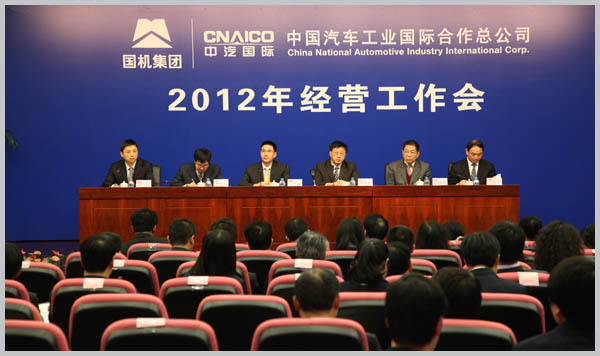 Jia Yu, general manager of business management department, briefly described the newly revised “Business Objective Performance Appraisal Management Approach of CNAICO in 2012” at the meeting. Subsequently, president Ji Xuecheng signed 2012 responsibility letters of business objectives with heads of the business units and subsidiaries respectively. The meeting made the company's overall development ideas and business objectives clear in 2012, pointing out the direction and building confidence for the cadres and employees promoting work by unity of thinking.